This article is about the 1970s band featuring Paul McCartney. For the late 1960s American folk rock band, see Wings (1968 band). Wings, 1975. L–R: Joe English, Denny Laine, Linda McCartney, Jimmy McCulloch, and Paul McCartney. Wings, also known as Paul McCartney and Wings, were an Anglo-American rock band formed in 1971 by former Beatle Paul McCartney with his wife Linda on keyboards, session drummer Denny Seiwell, and former Moody Blues guitarist Denny Laine. Wings were noted for frequent personnel changes as well as commercial success, going through three lead guitarists and four drummers. However, the core trio of the McCartneys and Laine remained intact throughout the group's existence and McCartney continued playing bass and other assorted instruments, just as he had done with The Beatles. In 1977, the band earned their only UK number one single, with "Mull of Kintyre", which became the then-best selling UK single in history. Wings experienced another line-up shuffle, however, with both McCulloch and English departing before the release of the group's 1978 album London Town. The McCartneys and Laine again added new members, recruiting guitarist Laurence Juber and drummer Steve Holley. The resulting album, Back to the Egg, was a relative flop, with its singles under-performing and the critical reception negative. During the supporting tour, Paul McCartney was arrested in Japan for cannabis possession, putting the band on hold. Despite a final US number one, the live version of McCartney's solo single "Coming Up", Wings broke up permanently in 1981. After the release of Ram, McCartney decided to form a new group and asked Seiwell and McCracken to join. 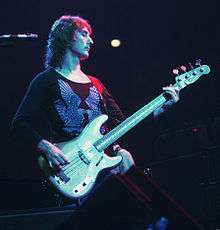 Seiwell accepted, but McCracken declined, so McCartney invited Denny Laine, whom he had known since the early 1960s, to join. Laine, who was working on a solo album at the time, got a phone call from McCartney enquiring if he would like to work with him, as McCartney said: "I'd known him in the past and I just rang him and asked him, 'What are you doing?' He said, 'Nothing', so I said, 'Right. Come on then!'" Laine then dropped plans for his album there and then. In August 1971, Seiwell and Laine joined Paul and Linda McCartney to record Paul's third post-Beatles album for Apple Records. The result was Wild Life, released 7 December. It was the first project to credit Wings as the artist. The band name is said to have come to McCartney as he was praying in the hospital while Linda was giving birth to their second child together, Stella, on 13 September 1971. Paul McCartney recalled in the film Wingspan that the birth of Stella was "a bit of a drama"; there were complications at the birth and that both Linda and the baby almost died. He was praying fervently and the image of wings came to his mind. He decided to name his new band "Wings". With the band reduced to a trio, the McCartneys and Laine cut what turned out to be Wings' most successful album, Band on the Run, at EMI's primitive eight-track recording studio in Lagos, Nigeria. The album went to number 1 in both the US and UK and spawned three hit singles: the rockers "Jet" and "Helen Wheels" (originally included only on the US version of the album) and the title track – a suite of movements recalling side two of Abbey Road. It also included "Let Me Roll It", which was seen as an affectionate impersonation of John Lennon's vocal style, and "No Words", the first Wings song on which Laine received a co-writing credit beside the McCartneys. Band on the Run enjoyed a highly favourable response from music critics and restored McCartney's tarnished post-Beatles image. After Band on the Run, Jimmy McCulloch, former lead guitarist in Thunderclap Newman and Stone the Crows, joined the band. The first Wings project with McCulloch was McGear, a 1974 collaboration between Paul and his younger brother Mike McGear, with session musician Gerry Conway playing drums. Warner Bros. Records chose not to play up the "Wings" angle in its marketing for McGear, and the album sold poorly. However, the sessions also generated a single credited to McGear's group the Scaffold, "Liverpool Lou", which became a top-10 hit in the UK. Shortly thereafter, Geoff Britton joined Wings on drums, and the first recording session with this full line-up was held in Nashville, where the band stayed at the farm of songwriter Curly Putman Jr. The trip was immortalised in the 1974 non-album single "Junior's Farm", backed with a straight country track entitled "Sally G", the group's last release on Apple Records. In a rare occurrence, both sides of the single separately reached the Billboard Top 20 in the US. During these sessions, Wings (with guest musicians Chet Atkins and Floyd Cramer) also recorded a single that was attributed to "the Country Hams" entitled "Walking in the Park with Eloise", a song written years before by Paul's father James. The core trio of Wings then released the album London Town in 1978. Though only the remaining trio are pictured on the sleeve, much of the album included McCulloch and English, having been recorded before their departures. It was a commercial success, although it became the first Wings album since Wild Life not to reach number 1 in the US (peaking at number 2). London Town featured a markedly softer-rock, synth-based sound than previous Wings albums. "With a Little Luck" reached number 1 in the US and number 5 in the UK, but "I've Had Enough" and "London Town" were commercial disappointments in both countries. Paul McCartney and his family arrived in Japan on 16 January 1980 for the planned eleven-date Wings' concert tour of Japan (due to visit Budokan Hall, Tokyo from 21 to 24 January 1980; Aichi-Ken, Taiiku-Kan, Nagoya on 25 & 26; Festival Hall, Osaka on 28; Osaka Furitsu-Kan, Osaka on 29; Budokan Hall, Tokyo from 31 January to 2 February 1980). McCartney was arrested immediately upon arriving at New Tokyo Airport for possession of 219 grams (7.7 ounces) of marijuana (with a street value of 600,000 yen) hidden in Paul's luggage. The arrest put the tour in jeopardy and Wings' music was immediately banned from all television and radio stations across Japan. Wings' Japanese promoters claimed that almost 100,000 tickets for the concerts had been sold, representing a possible loss of well over 100 million yen. The promoters had no option but to cancel all of the tour dates the day after McCartney's arrest. The other band members of Wings, except Linda, left Japan and returned to England on 21 January 1980. McCartney spent ten days in jail before being (unexpectedly) released without charge on 25 January 1980 and deported. After returning to England, McCartney decided to release his solo album McCartney II and plans for a US tour were dropped. Meanwhile, Denny Laine released the single "Japanese Tears" and formed the short-lived Denny Laine Band with Steve Holley and released a solo album Japanese Tears that December. In October 1980, McCartney began work on his next album, Tug of War, with Beatles producer George Martin. For this album, Martin and McCartney decided to record with a variety of guest musicians instead of Wings. Wings reconvened in January 1981 to work on the Cold Cuts album of previously unreleased songs, and Denny Laine continued to participate in the Tug of War recording sessions in Montserrat in February, but on 27 April 1981, Laine announced he was leaving Wings due to McCartney's reluctance to tour in the wake of John Lennon's murder. In March 1997, Denny Laine, Lawrence Juber and Steve Holley did an impromptu "Wings" reunion at a Beatlefest convention in East Rutherford, New Jersey. This was not a planned event, and no further reunions were intended. However, ten years later, in July 2007, Laine, Juber and Denny Seiwell reunited for one show at a Beatlefest convention in Las Vegas. Among other songs, they performed "Band on the Run", "Mull of Kintyre" and "Go Now". According to one report, Laine said that the three were discussing plans for a reunion tour. Laine and Seiwell appeared again at The Fest For Beatles Fans in Secaucus, New Jersey, in March 2010 and were joined by Juber at the Fest in Chicago in August 2010. Laine, Juber and Seiwell performed together at the Fest for Beatles Fans in Los Angeles, California, in October 2014; the setlist included "Hi Hi Hi", "Live and Let Die" and "Rockestra Theme". Wings had 12 top 10 singles (including one number 1) in the UK and 14 top 10 singles (including six number 1's) in the US. All 23 singles released by Wings reached the US top 40, and one double-sided single, "Junior's Farm"/"Sally G", reached the top 40 with each side. Of the nine albums released by Wings, all went top 10 in either the UK or the US, with five consecutive albums topping the US charts. 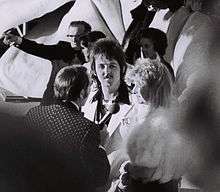 Paul McCartney was unquestionably Wings' leader and star, but Denny Laine, Jimmy McCulloch, Laurence Juber, and Linda McCartney all wrote songs for the group, and Laine, McCulloch, English, and Linda McCartney all performed lead vocals. Nevertheless, all of the band's songs that were released as singles were at least co-composed by Paul McCartney, with the exceptions of "Seaside Woman" and "Walking in the Park with Eloise," both of which were released under pseudonyms. The success of Wings was a vindication for McCartney (although at least one commentator felt that McCartney really did not need the vindication). His early, homemade solo output, which often featured simpler songs and less lavish production than the Beatles received from George Martin, was often dismissed by critics as "lightweight" next to the more serious nature of his former bandmates' solo output. Moreover, McCartney's singles experienced more uneven chart performance than those of his former bandmates in the years immediately following the breakup of the Beatles. But by the mid-1970s, the solo careers of the other three former Beatles were in varying degrees of decline, with John Lennon putting his career on hold in 1975 for the first five years of his son Sean's life. A year later, George Harrison had all but retired from live performances, with his new releases failing to match the success of his initial solo output. Ringo Starr was living in Los Angeles and was writing and recording successfully, but as a solo artist had not been performing onstage other than rare guest appearances (and would not tour until many years later, in 1989). Meanwhile, Wings continued to tour regularly and to enjoy hit singles and albums the world over. By 1980, Lennon was envious enough of McCartney's continuing success to make his re-emergence on the music scene that year. During its 10-year life, Wings had only one fewer number 1 single in the US than Lennon, Harrison, and Starr combined in their entire post-Beatle careers. One of the controversies regarding Wings was whether the other members represented nothing more than sidemen backing up a solo McCartney. In an interview, Laurence Juber, Wings' third lead guitarist, said, "I was a sideman, but the job assignment very much included considering myself a part of the band. . . . In all its incarnations Wings sounded like a band, not like a solo McCartney project and I think that reflects well not only on Paul’s ability to share in the creative process, but also on the importance of Denny and Linda’s contributions, too. The other players brought their own personalities to the scene." Wings' 1977 single "Mull of Kintyre"/"Girls School" is still the biggest-selling non-charity single in the UK (although Queen's "Bohemian Rhapsody" sold more, its sales include a reissue in aid of the Terrence Higgins Trust), and it ranked fourth in the official list of all-time best selling singles in the UK issued in 2002. ↑ "Milestones, Sep. 26, 1977". Time. 26 September 2007. Retrieved 30 July 2016. ↑ Johnstone, Andrew (6 February 2015). "A General Guide to Soft Rock". Rip It Up. Retrieved 30 July 2016. ↑ uao (3 July 2005). "Sunday Morning Playlist: Soft Rock". Blogcritics. Retrieved 30 July 2016. 1 2 3 4 Lewisohn, Mark (2002). Wingspan. Little, Brown and Company (New York). ISBN 0-316-86032-8. 1 2 3 4 5 Miles, Barry; Badman, Keith, eds. (2001). The Beatles Diary After the Break-Up: 1970–2001 (reprint ed.). London: Music Sales Group. ISBN 978-0-7119-8307-6. ↑ Perone, James E. (2012). The Album: A Guide to Pop Music's Most Provocative, Influential, and Important Creations. ABC-CLIO. p. 147. ISBN 978-0-313-37907-9. ↑ Wright, Jeb. Denny Seiwell of Wings. Interview, Classic Rock Revisited website. Retrieved 17 May 2007. ↑ Erlewine, Stephen Thomas. "Wild Life – Paul McCartney, Wings : Songs, Reviews, Credits, Awards". AllMusic. Retrieved 18 April 2013. ↑ Woffinden, Bob (1981). The Beatles Apart. London: Proteus. pp. 47, 62–63. ISBN 0-906071-89-5. ↑ Madinger, Chip; Easter, Mark (2000). Eight Arms to Hold You: The Solo Beatles Compendium. Chesterfield, MO: 44.1 Productions. p. 151. ISBN 0-615-11724-4. ↑ Frontani, Michael (2009). "The Solo Years". In Womack, Kenneth (ed.). The Cambridge Companion to the Beatles. Cambridge, UK: Cambridge University Press. pp. 164–65. ISBN 978-0-521-68976-2. ↑ Ingham, Chris (2005). "Introduction: Ten Years After". In Hunt, Chris (ed.). NME Originals: Beatles – The Solo Years 1970–1980. London: IPC Ignite!. p. 14. 1 2 Carr, Roy, and Tyler, Tony. The Beatles: An Illustrated Record. New York: Harmony Books, a subsidiary of Crown Publishing Group, 1975. ISBN 0-517-52045-1. ↑ Doggett, Peter (2011). You Never Give Me Your Money: The Beatles After the Breakup. New York, NY: It Books. pp. 177, 194–95, 208. ISBN 978-0-06-177418-8. ↑ Schaffner, Nicholas (1978). The Beatles Forever. New York, NY: McGraw-Hill. p. 156. ISBN 0-07-055087-5. ↑ Rodriguez, Robert (2010). Fab Four FAQ 2.0: The Beatles' Solo Years, 1970–1980. Milwaukee, WI: Backbeat Books. pp. 43, 95–96, 180. ISBN 978-1-4165-9093-4. ↑ "How On Earth Do You Follow The Beatles? Paul McCartney On Wings". Uncut.co.uk. Retrieved 18 April 2013. ↑ However, McCartney played a solo version of "Let It Be", on piano, at Nottingham. Paul McCartney biography(2003). MPL Communications. Retrieved: 11 December 2006. 1 2 The seven ages of Paul McCartney, BBC News, 17 June 2006. Retrieved on 6 November 2006. 1 2 3 4 5 6 "Official Charts: Paul McCartney". The Official UK Charts Company. Retrieved 18 April 2013. ↑ Garbarini, Vic (1980). The McCartney Interview [interview LP], Columbia Records. ↑ Mulligan, Kate Siobhan (2010). The Beatles: A Musical Biography. Santa Barbara, Calif.: Greenwood. p. 150. ISBN 978-0-313-37686-3. ↑ "Red Rose Speedway – Paul McCartney, Wings: Awards". allmusic.com. Retrieved 17 April 2013. ↑ Benitez, Vincent P. (2010). The Words and Music of Paul McCartney: The Solo Years. Santa Barbara, Calif.: Praeger. p. 43. ISBN 978-0-313-34969-0. ↑ Sounes, Howard (2010). Fab: An Intimate Life of Paul McCartney. London: HarperCollins. pp. 302–03. ISBN 978-0-00-723705-0. ↑ Doggett, Peter (2011). You Never Give Me Your Money: The Beatles After the Breakup. New York, NY: It Books. p. 208. ISBN 978-0-06-177418-8. ↑ Madinger, Chip; Easter, Mark (2000). Eight Arms to Hold You: The Solo Beatles Compendium. Chesterfield, MO: 44.1 Productions. pp. 180–81. ISBN 0-615-11724-4. ↑ Clayson, Alan (2003). Paul McCartney. London: Sanctuary. p. 167. ISBN 1-86074-486-9. ↑ Rodriguez, Robert (2010). Fab Four FAQ 2.0: The Beatles' Solo Years, 1970–1980. Milwaukee, WI: Backbeat Books. p. 210. ISBN 978-1-4165-9093-4. ↑ Sounes, Howard (2010). Fab: An Intimate Life of Paul McCartney. London: HarperCollins. pp. 308–10. ISBN 978-0-00-723705-0. ↑ Rodriguez, Robert (2010). Fab Four FAQ 2.0: The Beatles' Solo Years, 1970–1980. Milwaukee, WI: Backbeat Books. p. 204. ISBN 978-1-4165-9093-4. ↑ Madinger, Chip; Easter, Mark (2000). Eight Arms to Hold You: The Solo Beatles Compendium. Chesterfield, MO: 44.1 Productions. p. 189. ISBN 0-615-11724-4. ↑ Frontani, Michael (2009). "The Solo Years". In Womack, Kenneth (ed.). The Cambridge Companion to the Beatles. Cambridge, UK: Cambridge University Press. pp. 166–67. ISBN 978-0-521-68976-2. ↑ Ghosh, Palash (16 July 2013). "Band On The Run: 40 Years Ago, Paul McCartney Saved His Career With An Album Made Under Duress In Nigeria". International Business Times. Retrieved 11 January 2016. 1 2 Bailey, Jerry. "Paul and Linda Try the Gentle Life", The Tennessean, 18 July 1974. Retrieved 9 June 2007. ↑ Joe English biography at Drummer Academy.com. ↑ "Wings Over America". paulmccartney.com. Retrieved 15 April 2013. ↑ McGee, Garry (2003). Band on the Run: A History of Paul McCartney and Wings. Rowman & Littlefield. p. 106. ISBN 978-0-87833-304-2. ↑ Calkin, Graham. "Paul McCartney – Maybe I'm Amazed". Jpgr.co.uk. Retrieved 17 April 2013. 1 2 3 4 "The Wings Japanese Tour That Wasn't (Wings' 1980 Japan Tour) (by James Bjorkman)". paulmccartney.filminspector.com. 20 May 2013. Retrieved 3 May 2015. 1 2 3 4 5 6 7 "Paul McCartney is arrested in Japan for marijuana possession". beatlesbible.com. Retrieved 3 May 2015. 1 2 Wasserman, Harry. "Paul's Pot-Bust Shocker Makes Him A Jailhouse Rocker". High Times, July 1980. Retrieved 17 March 2010. ↑ Terrill, Marshall (15 October 2010). "Ex-Wings guitarist, Laurence Juber, talks about having Paul McCartney as a boss". daytrippin.com. Retrieved 23 June 2012. ↑ Gambaccini, Paul "The RS Interview: Paul McCartney". Rolling Stone, 31 January 1974. Retrieved 14 May 2007. ↑ 1997 "Wings" photo page by Michael Cimino Archives. ↑ "Wings Alumni to Take Flight", ClassicRockCentral.com, 10 July 2007. Retrieved 17 September 2007. ↑ The Fest for Beatles Fans " Blog Archive " Denny Laine & others added to NY METRO Lineup. Retrieved 20 February 2010. ↑ Bronson, Fred. "Silly Love Songs", from The Billboard Book of Number One Hits; p. 436; Billboard Books, 2003. ISBN 978-0-8230-7677-2. Retrieved on 3 June 2009. ↑ Rosen, Robert. Nowhere Man: The Final Days of John Lennon. 2001, pp. 135–36. ISBN 978-0-932551-51-1. 1 2 Terrill, Marshall (15 October 2010). "Exclusive: Ex-Wings guitarist, Laurence Juber, talks about having Paul McCartney as a boss". Daytrippin' Magazine. Retrieved 13 April 2016. ↑ Thompson, Dave. "Holly Days – Denny Laine : Songs, Reviews, Credits, Awards". AllMusic. Retrieved 18 April 2013. ↑ Morgan-Gann, Theo. The UK's Top 10 Best Selling Singles, ukcharts.20m.com. Retrieved 12 March 2008. ↑ UK All-Time Best Selling Singles, Listology. Retrieved 12 March 2008. ↑ Harry 2002, pp. 845–851: Wings tours details; Lewisohn 2002, pp. 170–171: Wings tours dates. ↑ "Grammy Awards Won by Paul McCartney". Grammy.com. Retrieved 3 October 2007. ↑ "List of 48th Annual Grammy Award Winners". CBS News. 9 February 2006. Archived from the original on 5 May 2007. Retrieved 3 October 2007.